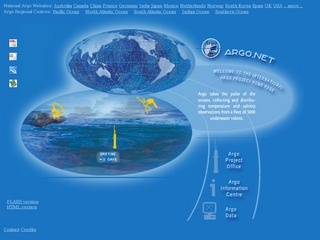 The international Argo project began in 2000 with the goal of establishing a global array of profiling robotic floats in the ocean. By October 2007 it had achieved its initial goal of 3000 operational floats. These provide around 100,000 observations of temperature and salinity throughout the ice-free deep ocean each year. Around 800 floats must be deployed each year to maintain the array. This global network of profiling floats allows us to monitor the physical state of the upper ocean continually, with the data being made available in near real-time. All floats measure temperature and salinity but, as float technology is developed, a wide range of extra sensors are being added to some new floats - enabling additional measurement of biogeochemical parameters.